Etalon are a Soviet / Russian family (Etalon-1, Etalon-2) of passive geodetic satellites dedicated to satellite laser ranging. Etalon-1 was the first geodynamic satellite launched by the former Soviet Union. The Etalon spacecraft were launched in 1989 in conjunction with a pair of GLObal'naya NAvigatisionnay Sputnikovaya Sistema (GLONASS) satellites. The mission objectives were to determine a high accuracy terrestrial reference frame and earth rotation parameters; to improve the gravity field, and to improve the gravitational constant. The Etalon satellites are passive satellites. The only instrumentation is the retro-reflector array which consists of 2 different type of cube corners. 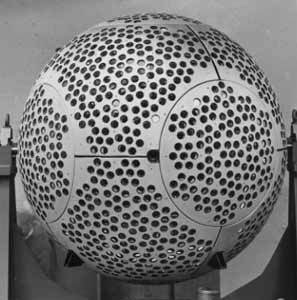 Each Etalon satellite is a 1.294 m diameter sphere. The diameter of the sphere touching the corner cube reflector (CCR) faces is 1284 mm (the difference does not cause any masking). There are a total of 2140 fused-quartz CCR's (304 arrays 7 CCR's each and 2 arrays 6 CCR's each) plus 6 germanium CCR's. Each CCR has the same dimensions and is made of the same material (fused quartz). The same CCRs were used on GLONASS. The satellite surface is made of aluminum-titanium alloy with an integral coefficient of diffuse reflectivity 0.7 (on average), but IPIE before-launch measurements show some difference when observed from different directions, so there can be some brightness variation during the satellite rotation. The CCR distribution over the satellite surface is not absolutely uniform for technological reasons (some space is needed for the holders and separation device), so the correction value relative to the CoM (which is within +3 mm from the sphere center) may vary for different observation directions. For the same reason, there is also a small variation in the equivalent optical cross-sections (no more than +15 %, according to the measurement results). The mean correction value is 562.0 mm with an RMS error for various observation directions 11.35 mm. All the CCR's have aluminum-coated reflecting surface.